Hello beautiful people! It's Sunday and I thought let me share review for a product which is awesome and great for current hot and humid weather. 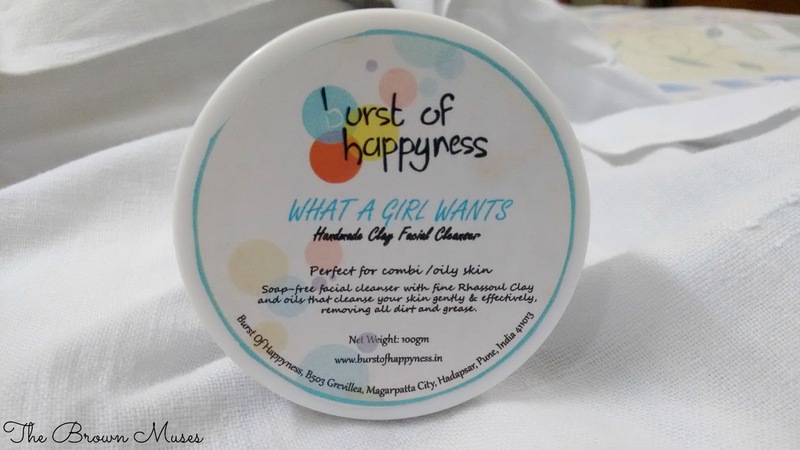 Today, we are featuring a product called Burst Of Happyness' What A Girl Wants Facial Cleanser which is handmade, vegan and cruelty free. Burst Of Happyness is a brand based in Bhiwadi, Rajasthan founded by Mrs Shreya Pawar. BOH painstakingly makes a lot of other skincare and hair care products which are handmade, cruelty free and vegan. So those looking for vegan handmade products know where to head. I am crazy about Bob Dylan, Douglas Adam , fantasy fiction, Radiohead and animals. That's why I decided to take things in my own hands and got down to making soap. It began with a lot of research (yes a lot and then some more), talking and learning from experienced soap makers, reading books on soap making , studying aromatherapy, natural healing and benefits of various oils and botanicals. My first soap was an olive oil + coconut oil soap, also known as a Bastille soap. And surprisingly, I got it bang on! It was a beautiful, mild, creamy soap which suited me very well. Thus began my love affair with natural skincare with numerous trials - some of which were successful while others were total disasters. Initially, my products were meant only for friends and family but I was quite surprised to receive numerous inquiries for customized products. That's when I realized that there are others who, like me, struggle with numerous skin issues, sensitivities and are looking for effective, "honest", natural skincare. After a lot of deliberation and learning more about the nitty-gritties of cosmetic manufacturing, I decided to launch "Burst Of Happyness" in 2012. When not working, I spend time walking my dogs June and Dazzle, experimenting with food, feeding birds, day dreaming and living the life of an "Indian Army Wife". My work reflects my personal values and beliefs, and as I adopt a more healthy, cruelty free, lifestyle; I have veganized all my products so that they are not only good for your skin but also light on your conscience. So that's a bit about me. Hope to see you around..
What a Girl Wants is a soap free, rhassoul clay based cleanser which will cleanse your skin gently, effectively, removing all dirt and grease. It contains jojoba oil which has a non-greasy texture, light weight and anti-inflammatory properties making it an ideal ingredient to use for treating acne-related skin problems. It is a very good moisturizer as it is similar to the natural oils that our bodies produces. Rose petals add a royal touch to it as it contains antioxidants and vitamins which are good for the skin. Rhassoul Clay, is mined in the fertile Atlas Mountains of Morocco. Its most impressive properties in skin improvement are its capacity of absorption due to its high level of ions exchange. 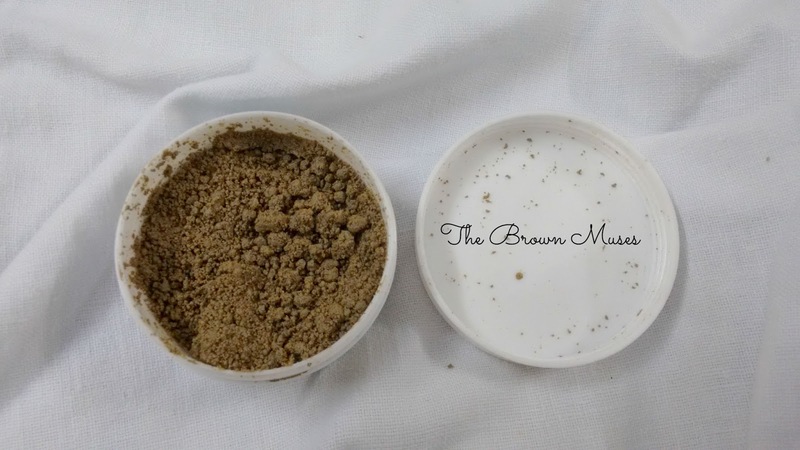 Studies have shown that it is reputed to reduce dryness and flakiness, improve skin clarity and elasticity. It is rich in magnesium, Silica, potassium and calcium. Tea Tree Oil and Lavender Essential Oil are well known for their anti bacterial properties and are known to help oily, acne prone skin. This clay facial will leave your face so moist and soft you will think twice putting on a moisturizer. 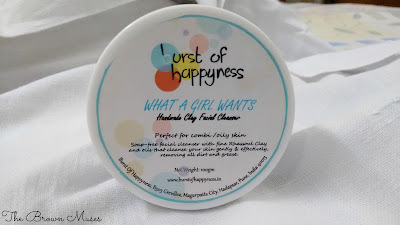 Firstly, I love the name of the brand as well as the product, it exudes positivity and using Mrs. Pawar's products is indeed a 'Burst Of Happyness'; it's like happiness packaged in a small plastic tub or in a cardboard box. :D What A Girl Wants Facial Cleanser comes in a white plastic tub, the packaging isn't really the best but I don't mind it, really. The cleanser is grey-ish brown in colour and grainy in texture. It smells heavily of tea tree oil. Those who are sensitive to strong smells may not like it. 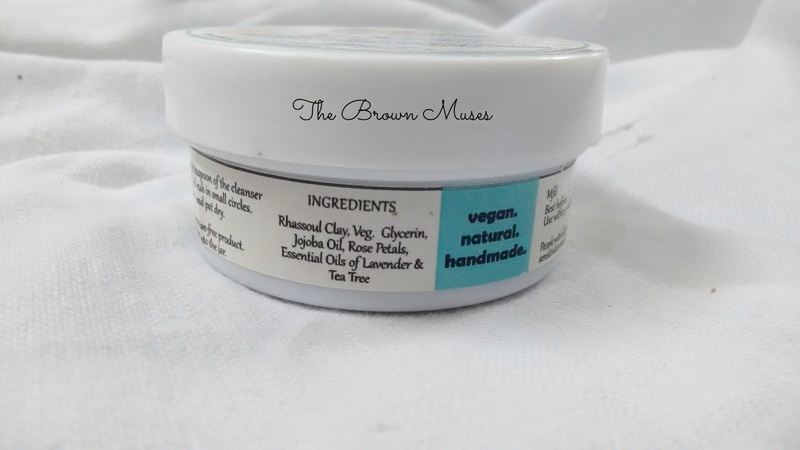 This is my second tub and this is my HG product, this product works best in hot and humid weather as my skin tends to get oily, precisely the T-Zone and this product contains all the ingredients that would suit oily skin. I use this product once a day at night as part of my CTM routine and it helps in controlling sebum production to an extent, since my skin doesn't breakout a lot so I cannot comment if it's going to help with that but having said that it should help with breakouts too. One more thing I like about the product is that since very little quantity is required to wash the face, the product really lasts long and no, it doesn't go rancid quickly but all you gotta do is avoid digging wet spoon or fingers in it as the product doesn't contain no artificial preservatives to increase longevity. I use a clean and dry wooden spoon to scoop out the desired product, mix it with few drops of water (it emulsifies with water like a breeze) and scrub it across my face. The grainy texture of the cleanser also renders mild exfoliating effect which is great. After washing my face, my skin feels supple, tidy and refreshed. This cleanser is better than any chemical laden face washes that are available in the markets and since very little quantity is required, I find it cost effective too. Will I recommend: A big fat YES! We would love to hear from you guys too. Tell us which facial cleanser are you using at present?